Since 25 years, we are engaged in offering Carpets and Rugs, Shawls, Stoles, Scarves, Muffler, Table Cover, Runners, Mats, Pashmina Sweaters, Handmade Chain Stitch Rugs and Bed Spreads & Covers. 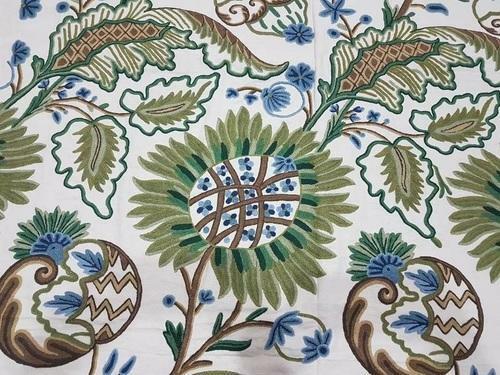 In addition to these, we are also offering Cushion Covers, Ladies jackets, Gowns, Caftans & tops, Ladies bags & Purses, Wall Hangings, Pray Rugs and Crewel Furnishing Fabric. These are widely acknowledged for elegant color combination, exclusive designs and colorfastness attributes. Our entire range of handicraft items successfully caters to requirements of clients based in Poland, Qatar, U.S.A, Denmark, Brazil, Italy, Belgium, Mexico, Spain, Greece, North America, South America, Mid East and Western Europe. Our skilled artisans have enabled us to design and develop our carpets from 256 knots to 6400 knots per square inch. They make use of quality yarns such as spun silk, woolen, rayon and cotton that are stringently tested by our quality controllers on various parameters before being used in production process. Moreover, to meet the varied requirements of our clients, we offer customization facility as well. In addition to this, we also offer OE products as well as private labeling to our clients.